Minz received the award along with a cash prize of Rs 5 lakh from Indian cricketer Dilip Vengsarkar at a special function held at Bhubaneswar on Sunday. Lilima Minz represented the Indian senior team for the first time in 2011 during a four-nation tournament in Argentina. She was also part of the squad that represented the country in the 2016 summer Olympics. Minz was also part of the Indian team that won the gold medal in Women’s Hockey Asia Cup after a gap of 13 years in Japan on November 5, 2017. 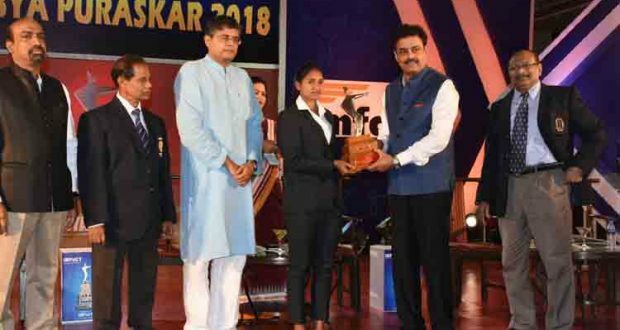 Apart from Lilima Minz, two other sportspersons including badminton player Rutuparna Panda were felicitated for their outstanding achievements in their field. Coach P Dharma Rao received the citation on behalf of weightlifter Jhili Dalabehera as she could not attend the award function today. Both Rutuparna and Jhili Dalabehera received a cash award of Rs 50,000 each along with citations. IMPaCT has been promoting literature, sports, arts, culture and other socially meaningful activities in the state for decades.